If Obama was 100% White, the Republicans would have dug up the Queen of Sheba; to deliver Gold to the White House for all that he has done for America! I have lived long enough and seen America’s blood spilled in senseless wars by Jackasses who take the oath of the Presidency. One would think that after the lessons of Vietnam it wasn’t possible for George W. Bush to order our troops into Iraq but he did. Just imagine, the brainless man who got into office solely because his brother shop-lifted the State of Florida, started two wars that cost American lives and trillions of tax payers dollars. In Libya if the people really want democracy they will have to fight to earn it. We assisted along with other countries and the Dictator is gone. It is going to take time with good and bad entwined and intertwined and eventually Libyans will hopefully, one day become a country with hopes and dreams for better tomorrows. Most of the time we in America always seem to forget our past after we expelled the British. How many Americans died during our Civil War? How long did it take to come to grips with ending slavery; enacting equal rights and to this day some still can’t see women being equal to men. Yes, Benghazi was a tragedy and we will learn from it, but to watch the Republicans and some in the Media exploit this tragedy as a means to an end, that is worst than the tragedy itself. President Regan sent the Marines to do peace keeping in Lebanon and they were given instructions “not to keep their rifles loaded.” A crazy man drove a pick up truck loaded with explosives and killed 243 our Soldiers. Regan recalled the remainder of the Marines and there wasn’t any bitching about that as it is with Benghazi. Why is that? Well, these [white] assholes in Congress can’t stand the fact that a half white man is residing in their White House; using their Air Force One and are guarded by their Secret Service. Obama’s leadership got the man who brought much grief upon us on September 11, 2001; Obama ended the Iraq war; Obama is closing down the war in Afghanistan; and, several Dictators have fallen by the wayside without any of our Soldiers being put into harms way; Obama took our country that Bush threw into the ditch and look at where we are today! I wonder, just wonder, if McCain had won the election and had the same accomplishments, what would some Americans be doing. 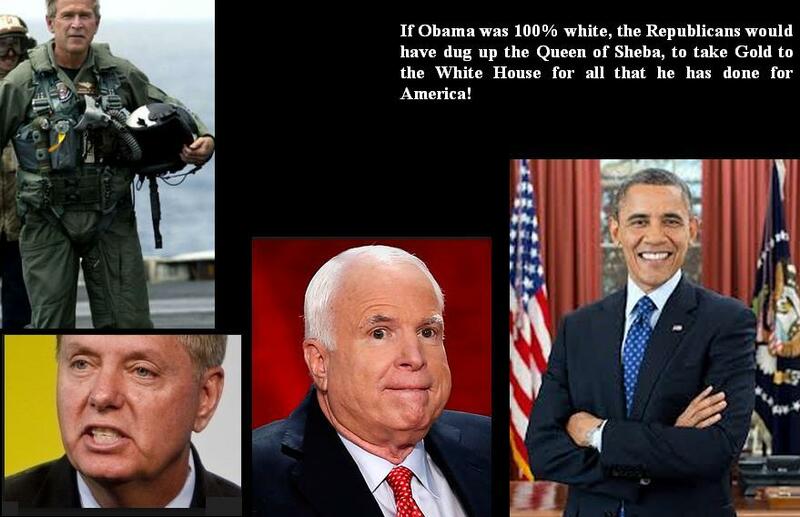 In my view, they would have dug up the Queen of Sheba to deliver Gold and Precious Gifts to the White House. This entry was posted on May 14, 2013 at 4:08 am and is filed under Uncategorized with tags Black, G.I. Joe jump suit, George W. Bush, Gold, john mccain, libya, Lindsay Graham, New York Times, Politics, President Obama, president regan, Queen of Sheba, Race, Republicans, senseless wars, tax payers dollars, White. You can follow any responses to this entry through the RSS 2.0 feed. Both comments and pings are currently closed.